What is the Brilliant Distinctions program? A new and improved way to save money on the cosmetic dermatology treatments you use most. 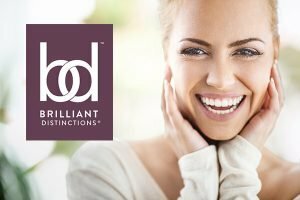 Simply sign up for the free Brilliant Distinctions (BD) program and tell us about your membership when you purchase Allergan products and services at Olympic Dermatology. As a BD member you get reward points you can redeem toward instant savings on your favorite products and procedures. And now BD members get more reward points and savings. Learn more about how it works in this video! Silver, gold and diamond tiers mean more opportunities to earn more points that you can redeem for savings ($10 or more per 100 points) on your next treatment or product. Also enjoy your anniversary points present and $20 for each friend you refer to the program. Your points never expire and you’ll get bonus points, SkinMedica gifts & more. What Procedures and Products Qualify for BD Points? These participating Allergan products and procedures at Olympic Dermatology are some of our most popular and include: Botox, Dermal fillers, Kybella, SkinMedica and Latisse. How Do I Redeem My Points for Discounts? Your cosmetic provider will issue points for a procedure or product purchase. Points will be deposited into your account within 2-3 days. You can use the earned points as early as your next treatment. Points can be redeemed for rewards (every 100 Points = $10). You may create rewards based upon your earned points and present that reward for savings on qualifying procedures and products at Olympic Dermatology. You don’t need to create rewards for online redemptions. It’s easy and free so JOIN TODAY!